He was the homilist at the 65th annual Red Mass in the nation’s capital. Celebrated the Sunday before the opening of the Supreme Court’s term, the annual Mass invokes the Holy Spirit upon those who are responsible for the administration of justice. The Mass is sponsored by the John Carroll Society, a network that aims to enhance fellowship among Catholic leaders in the Washington area and serve the archbishop of Washington. Washington Cardinal Donald W. Wuerl was the main celebrant. Concelebrants included Washington Auxiliary Bishops Barry C. Knestout, Mario E. Dorsonville and Roy E. Campbell Jr.; Archbishop Gomez; Bishop Michael F. Burbidge of Arlington, Virginia; Auxiliary Bishop Richard B. Higgins of the U.S. Archdiocese for the Military Services; and Cardinal John Olorunfemi Onaiyekan of Abuja, Nigeria. 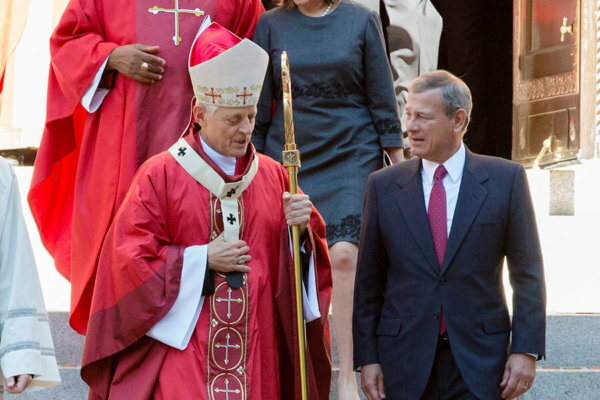 The distinguished guests at the Mass included five members of the Supreme Court: John G. Roberts Jr., chief justice of the United States; and Associate Justices Anthony M. Kennedy, Clarence Thomas, Stephen G. Breyer and Samuel A. Alito Jr.; and U.S. Solicitor General Noel Francisco. In his homily, Archbishop Gomez spoke about St. Junipero Serra, the newest American saint who was one of the founding missionaries of Los Angeles as part of a string of missions in California and was canonized by Pope Francis during the pontiff’s 2015 visit to Washington. By canonizing him, Archbishop Gomez said Pope Francis was making a point that “we should honor St. Junipero Serra as one of the Founding Fathers of the United States,” since the missionaries came here before the pilgrims and began their outreach before the nation’s first president was inaugurated. Those missionaries, along with the colonists and statesmen later on, laid the groundwork for “a nation conceived under God and committed to promoting human dignity, freedom and the flourishing of a diversity of peoples, races, ideas and beliefs,” said Archbishop Gomez, who is vice president of the U.S. Conference of Catholic Bishops. The readings for the Mass included the story of Pentecost, which Archbishop Gomez said “reveals the Creator’s beautiful dream for the human race,” where people from different nations were brought together through the Holy Spirit, who spoke to each of them in their native tongues. Archbishop Gomez noted that before God created the earth, he knew each person he would create and had a plan for each of their lives. “Every life is sacred, and every life has a purpose in God’s creation,” he said. 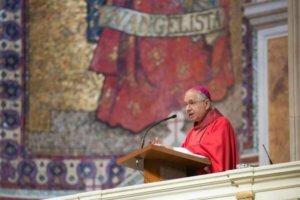 The Founding Fathers understood this teaching so well that they called the truths “self-evident,” said Archbishop Gomez. “America’s founders believed that the only justification for government is to serve the human person — who is created in God’s image; who is endowed with God-given dignity, rights and responsibilities; and who is called by God to a transcendent destiny,” said Archbishop Gomez. He called public service a “noble vocation” that requires honesty, courage, prudence, humility, prayer and sacrifice. “For all our weakness and failure: America is still a beacon of hope for peoples of every nation, who look to this country for refuge, for freedom and equality under God,” he added.